Kevin MacDonald: What do you expect us to do? Cole: Why don't you ask the sheriff? Kevin MacDonald: The sheriff? Ya think I'm gonna wait on him? Sheriff J. P. Harrah: Just give me an hour Macdonald. You can wait that long to die. Q: How similar is this film to Rio Bravo? Q: Why does Cole describe things to Macdonald that his dying son never said? Q: What kind of gun does Bull use throughout the film? This many not be the best western ever made, but it looks like an epic and is more fun than most movies by a hoot and a holler. It's got direction by Howard Hawks, characters, and people who actually talk to each other in intelligent dialogue and have to think, all set in a beautiful Western locale. John Wayne ably plays a man who has faces several challenges, in this fine screenplay by Leigh Brackett (of "The Big Sleep" and "Rio Bravo" fame). 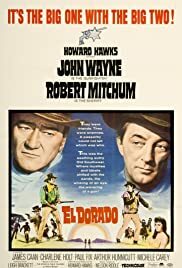 The challenges have to do with helping his hard-drinking friend, the Sheriff played by Robert Mitchum, combating a gang of badmen headed by powerful Edward Asner, and the fact that he's been shot in the back by mistake and that the pain causes him to be unable to move at inconvenient times. The production has a fine title sung by the great Ed Ames, titles by noted western artist Olaf Weighorst (who also appears as a gunsmith),; and its technical production is truly outstanding in every department Other actors contributing to this near-masterpiece of entertaining film-making include Arthur Hunnicutt, R.G. Armstrong, Christopher George and Charlene Holt in her best screen role ever. Outstanding contributions were made by Nellie Manley and Wally Westmore on hair and makeup, Edith Head on costumes and many others. 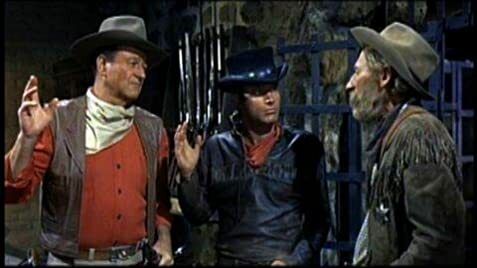 Altogether a very-satisfying, adult and physically beautiful color western; writer Brackett was asked by Wayne to include the saloon scene from "Rio Bravo" in a rewritten version, and it works just as well here; the major change is James Caan as Alan Trehearne, plus the change of cast to Mitchum, Hunnicxuut and Holt, who are all very good indeed.